Follow these steps and you will soon you’re only worry will be which job you want to accept. Anyone can land a great job just by following these proven steps. And by anyone – that includes you! It’s time to use your MacBook Pro for something actually professional. – You may not think at this age your resume would be a blank page but you’re wrong. A teenager’s resume can include clubs, chores around the house, entrepreneurial projects, grades, you name it. Consider listing anything that shows you are responsible, even if it may not be directly applicable to the job in which you are applying. – Get your resume and reference list proofread by a few people who you know already have great jobs. They know what a resume and reference letter should look like. This step is kind of like learning how to get ripped from someone with a six pack. You’re far better off listening to him than the guy who hasn’t seen his feet in a decade. – Tell family members, friends, and neighbors about your job search. Subtly encourage them to it around the community that you are a hard worker looking for a job. The goal here is to create a list of people who may be able to get you a job. If your neighbor works where you would like to, then he is your in. He is a person you need to know have in your professional network. – Join LinkedIn and create a profile (only takes about 10 minutes if you already have a resume and professional picture of yourself). Add the people you know and build that network of people. Remember the phrase… “It’s not what you know, it’s who you know.” In certain instances, this is definitely the case. – Don’t just choose a business because there’s a giant ‘Apply Inside’ sign out front. The best jobs are never advertised. Make a list of businesses in your area where you would be happy to work. Consider businesses that fit well with what you’re passionate about. Also consider how to get to these businesses. If you are too young to drive, make sure they are within biking distance. Three miles from home would be about a ten minute’s ride. – This is a direct approach and it works best. No one cares if you apply online or subtly drop off a resume. You need to work for the job! If you’re not willing to work for an interview, you definitely won’t be motivated to work during the job. – Wear the appropriate clothing for your desired position. Walk into the place of business with your resume and reference list like you own the place. Politely ask to speak with the manager. If one is not available, find out when to come back. Do not leave your resume and references until you are able to see the manager in-person. If you give someone else your documents, the manager may just assume he has enough information on you and not want to talk to you herself. You always want to have the chance to talk. They will remember you and when they remember you, they hire you. – Your goal is to prove you are not a typical teenager. Wear clothing appropriate for the job or nicer. Always carry a portfolio with your resume and references. Include several copies. It would be very impressive if a manager to come into your interview and you be able to hand them all your information. It shows you’re prepared. Convince the manager(s) that your maturity and work-ethic far exceed your age. Since you’re young the employer may be concerned about how often you can/will work. Tell them you are driven by your passion for the work and to make money. Believe it or not employers like to know you’re motivated by money. After all, they are as well. Say what your availability will be. Convince them you will be a reliable employee. If you live nearby, tell them that so they know it will be easy to make it into work. – People want to feel appreciated! Employers LOVE the feeling! Don’t you? It is one of the greatest emotions we can experience. The thank you letter can either be hand-written or typed. The biggest thing to know is you should NEVER email or text a thank you letter. It is extremely tacky. 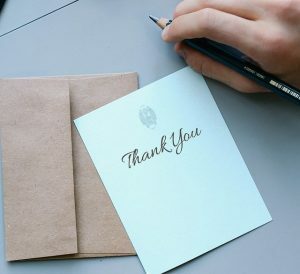 A true thank you letter written on quality paper will get attention. – In the letter you need to thank the person(s) for their time in meeting with you. It is also a good time to write about anything you forgot to mention in the interview. If your aunt is a loyal customer, maybe mention that. Name-dropping gets a person far in this world. – One summer I had two internships. At one internship I saw my intern profile sort of on accident. There was a hand signed note by an executive that said, “Very nice thank you letter following interview!” At my other internship, I saw my thank you letter propped up near my manager’s awards in his office. People like being thanked and quite frankly there is no excuse for not sending one to every person you met during the interview. Even send one to the receptionist. I have used this method of getting a job for my first job and really every job after. You never know what you will gain from getting your first job. Heck, I am typing this article from inside my first employer’s investment house nearly 10 years after he hired me! Did I mention I’m living in the best neighborhood in my city rent free?! The neighbor even does my yard work! After implementing these 6 steps into your job search, the only problem I can’t help you with is deciding which job you will accept! You may want to choose two!